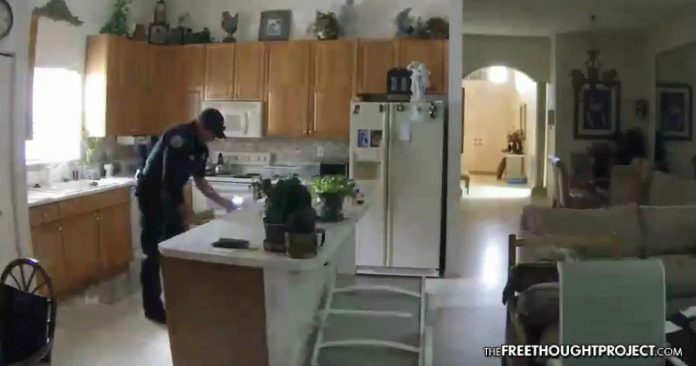 A Florida cop was caught on home surveillance video breaking into an elderly man's home and stealing his cash and prescription drugs. Boyton Beach, FL — A Palm Beach County deputy was arrested this month after he was captured on surveillance footage breaking into an 85-year-old man’s home in Boyton Beach and stealing his property. The cop was on duty at the time. During Hurricane Irma’s havoc last month, Moe Rosoff, the elderly victim of the Palm Beach County Sheriff’s Department, was riding out the storm in his home alone. However, when the power went out, Rosoff fell down and hit his head. When his family hadn’t heard from him, they called the police to conduct a welfare check. Three deputies responded to Rosoff’s home and found him on the floor in his master bedroom. He was taken to a local hospital, however, he would succumb to his injuries later that day and pass away. During the welfare check, Deputy Jason Cooke would receive Rosoff’s garage code over the radio. Knowing that no one would be home, Cooke decided to burglarize the home. Little did he know, however, that there was a nest surveillance camera watching his every move. Cooke was seen on video stealing money, jewelry, and several prescription medications from Rosoff’s home. When the family saw the video on September 20, they went directly to the Palm Beach County Sheriff’s Office. Naturally, Cooke denied the allegations against him. However, once he was shown the video, he was quickly caught in a lie. The family was shocked to find out that Cooke was not immediately placed under arrest. In fact, the sheriff’s office would wait five weeks before charging Cooke—in spite of video evidence of him committing felony burglary. Because of his blue privilege, Cooke was allowed to enter a 30-day drug rehabilitation program before they charged him. Aside from the shock of watching a cop burglarize their father and not get immediately arrested, the family was also outraged to learn that Cooke was working in full capacity under the influence of multiple narcotics. “If Officer Cooke was operating in his official capacity under these medications, it is our belief that he may have posed a significant threat to the public’s safety since just a few of the noted side effects of these medications include confusion, impaired thinking, impaired reactions, abnormal behavior, tremors, drowsiness, altered state of consciousness and anger,” the family said. Indeed, this officer has a problem and he used his badge to feed that problem at the expense of his victims. Finally, after five weeks of remaining free—despite video evidence showing he is a criminal—Cooke was arrested last week and charged with burglary and grand theft with a firearm. When asked why the deputy was allowed to remain free, the department chose to remain silent, releasing only the following statement. Cooke is currently on paid vacation pending the outcome of his trial. In America, police will legally break into your home and steal your property even if you are innocent. This practice is known as civil asset forfeiture. However, in the video below, a cop was arrested because he did not receive the approval from his superiors before stealing from an innocent person.